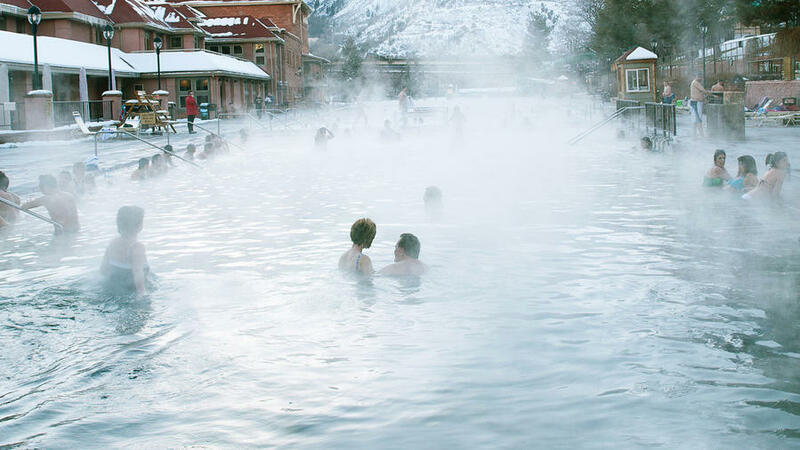 Holding 1,071,000 gallons, the big pool at Glenwood Hot Springs Resort (admission from $13.50; ) claims to be the world’s largest hot spring soak. The property has catered to spa seekers since 1888; these days, it’s best for splashy families or lap swimmers. Iron Mountain Hot Springs (from $20/ day; ), which opened its doors in 2015, features 16 smaller pools overlooking the Colorado River. Do like the residents do and take the plunge early in the morning, when you’ll practically have the water to yourself. For a twist on the sauna experience, descend into the subterranean vapor caves at Yampah Hot Springs & Spa ($15; ), where geothermally heated mineral water fuels the steam. Patrons young and old get their sugar fix at Sweet Coloradough (); here, egg-and-bacon sammies are made with doughnuts instead of bread slices. Not much for sweets? At The Pullman (), local restaurateur Mark Fischer serves up satisfying dishes like trout with almond romesco and truffle potato pierogies in a warm, modern setting. Then sleep it off at a spot where gunfighters like Louis “Diamond Jack” Alterie once took off their boots: The Hotel Denver (from $159; ). Within walking distance of the Glenwood Hot Springs Resort, the hotel no longer traffics in rough characters—just exposed brick, original art, and charming antique beds made up with tasteful quilts. If you can pull yourself from the hot springs, check out one of Colorado’s largest cave systems, which extends underfoot at Glenwood Caverns Adventure Park (tours from $29; ). Its passages are stuffed with fantastical stalactites and curtains of flowstone.